I haven't written in a while because I've been pretty busy. 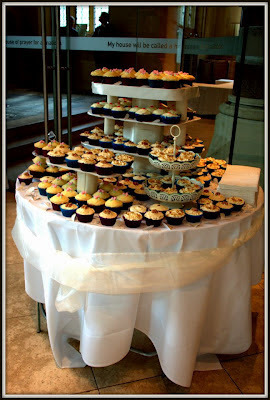 One of the things I've been busy doing is a cup cake stand for a friends wedding. The cupcake stand was made with 6mm MDF boards and the pillars were made from cut up cardboard tubes and wrapped with satin ribbons.The cupcake stand can hold about 80-100 cupcakes.